- Blue(wavelength: 400nm-520nm): Help plants grow. - Red(wavelength: 610nm-720nm): Help plants grow, and is the key for flowering plants. - Place this LED Grow lamp bulb in flat area when being unused. - Please make this LED grow lights work at proper working environment(-20~+40℃). - Check this LED Plant lights first before use. Any problems are free to contact us. New Upgrade LED Plant Grow Lights: Compared with old version, this A19 LED grow lights is ideal for indoor plants seedling, growing, flowering and riping at all growth stages; Low power consumption(6 Watts equivalent to 60W incandescent bulb); High lumious effeiciency(300 Lumens offering better light spectrum to plant growing than florescent lighting); Long working life(15, 000 hrs makes your plants enjoy sunlight with no worry of re-lamp). White Light( Similar to Pink): Red/blue 2 peak bands can provide plants, vegetables and flowers with light spectrum they need in the natural sunlight; Professional light proportion with perfect ratio of red and blue rays, providing better light envirnment to plants growth and improving growth speed and output of plants; No UV or IR radiation, and it will not hurt your plants even seeds. 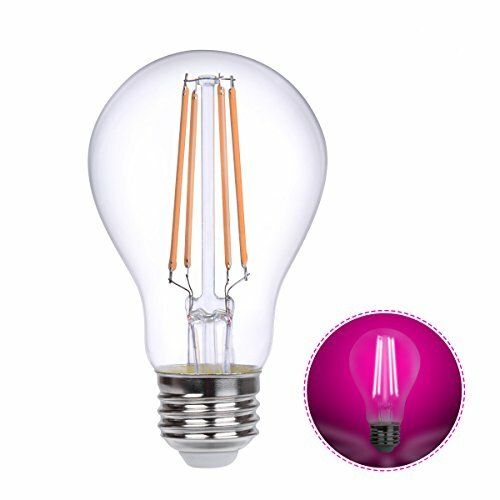 Energy-Saving & High Quality: Just at 6W, this LED grow bulb is equivalent to 60-watt incandescent bulb; 360° beam angle enables plants to get the most efficient energy during different growing stages, energy saving can be up to 80% comparing to traditional CFLs grow lights; Easy to install(E26 base fits for most recessed lighting, but may not be compatible with dimmers); HOLA LED grow lamp bulb shall present ordinary white light like a brand new LED bulb even after 1-year use. Professional Light Spectrum Ensures Higher Yields: Longer blue and shorter red wavelengths, suitable for planting; According to growing practice, this ratio could provide more suitable and useful light spectrum needed for leafy plants, flowering and food producing plants; Good for hydroponic growing, horticulture, seedlings and indoor potted plants growth in houses or offices, greenhouses, etc. Multiple Usage: Replacement of 60 watts incandescent light bulb; Plant lights, great substitute for other plant grow panels, flood lights or CFLs; Decorative LED filament bulb; Medium screw base( American standard E26 socket), easy to set up; Fully clear glass shell transmits 360 degrees white light to plants, helping to direct heat and keep appropriate temperature for plant growth; UL/CE/ROHS certificated, safe for indoor plants. If you have any questions about this product by TIMI Lighting, contact us by completing and submitting the form below. If you are looking for a specif part number, please include it with your message.